This week I spent two days supporting a company’s leadership team while they asked some burning questions. They had the insight to find an Airbnb that was both close to a major airport, and right on an urban beach. They had the insight to order in a load of groceries so that we could prepare and share meals together. For most of the time our conference room was a dining room table with a view of the ocean. I feel confident saying that everyone in that circle felt supported in expressing their true selves in the context of their shared work. The next day the CEO wrote me and said “We are the lucky ones, no?”. Yes, we who get to discover and share our best selves in the context of our work are the luckiest people in the world. Let’s keep going until everyone can. I don’t care about football, but I do care about how the Patriots are the Patriots. And I love smart advertising. But our indolence about the Super Bowl doesn’t mean that I’m not impressed with the Patriots’ team work. We all have a lot to learn from any group of people who have learned to think and act like a team. 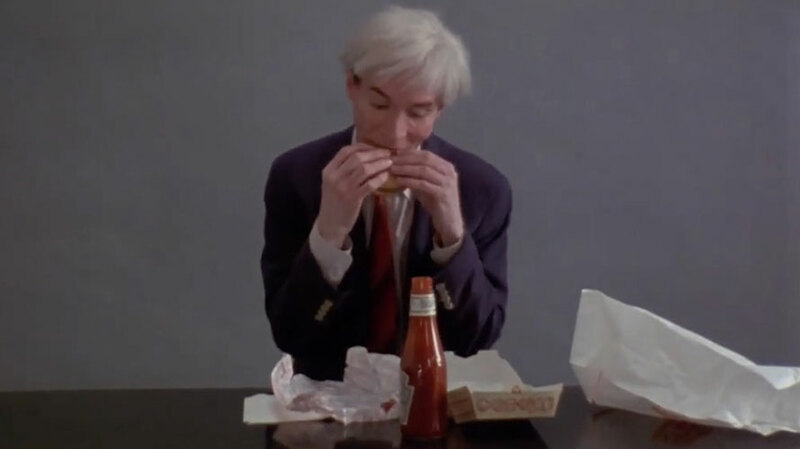 And the Burger King Andy Warhol ad was great. Mechanical systems are closed, human systems are open. Yet today feedback is used to correct and adjust both systems. Carol Stanford observes that this is a dangerous and irresponsible practice. She goes so far as to name it as one of our “Toxic Practices”. 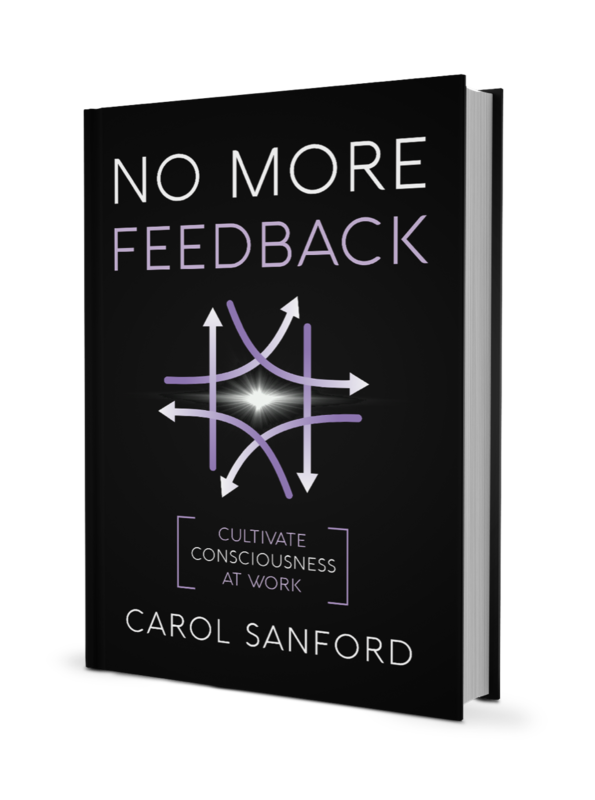 In this 6-part series she outlines why, and she suggests “a new set of operating processes based on paradigms or premises true to human nature.” She explains why feedback undermines employee development, the negative impact that feedback has on core human capabilities, and the clear alternative that leads to “self-regulating employees”. A body of research makes clear that consumers like it when brands take a political stand. “And where exactly does a company that’s been sewing blue jeans for the past 146 years find the authority to give anyone a lesson in the affairs of state? 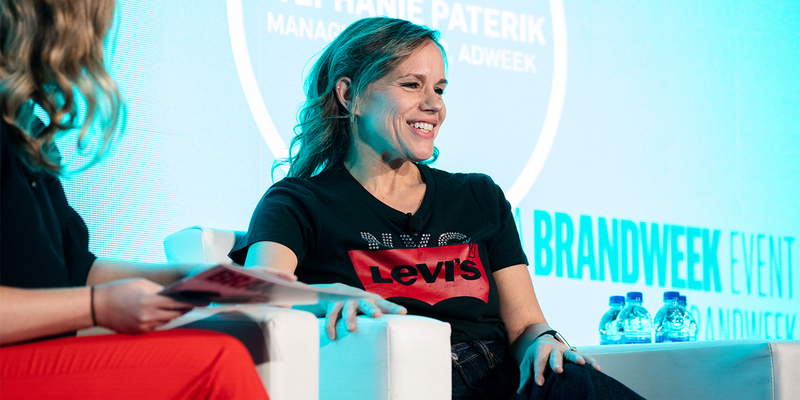 To hear CMO Jennifer Sey tell it, Levi’s is better positioned than most brands to do just that. The celebrity endorsement, the spurious feature, the fancy packaging, and the proliferating product line offering empty choice are all symptoms of segmentation gone slothful. “Done well, market segmentation can do so much. It can uncover entirely new markets (see Blue Ocean Strategy), provide new ways of serving existing markets and rejuvenate entire categories and industries (remember Swatch watches? ), out-maneuver competitors (Nike segments the market into very small niches so competitors are contained), and offer segment developers first-rights to the new market (The Walkman had a 50% market share at a 20% price premium for a couple of decades). “Sure, competitors catch up more quickly today than ever before – no brand has a free run forever, or even for very long. But since new product and idea adoption rates are quicker than ever, first-movers make a splash early, and move on with bulging pockets. Segmentation is still a winning game. The incentive to score is still huge. Segmentation spurs innovation. Don’t just try to make your customers feel good; strive to make them feel good about themselves. Article: Is Hospitality The Missing Element In Your Customer Service Culture? To tame your anger, it may help to take time to observe and name it. There is now clear evidence that anger isn’t one emotion but rather a whole family of emotions. And learning to identify different members of the family is a powerful tool for regulating your anger. Psychologists refer to the practice as learning to improve your “emotional granularity”. “…In many ways, anger is like wine. There are these major varieties — such as chardonnay and pinot noir — but each vintage has its own unique combination of aromas, flavors and potency. The more practice you have at detecting — and naming — these nuances, the better you understand wine. “And if you learn to detect all the various flavors and nuances of anger and label them, you can start to handle your anger better…”. 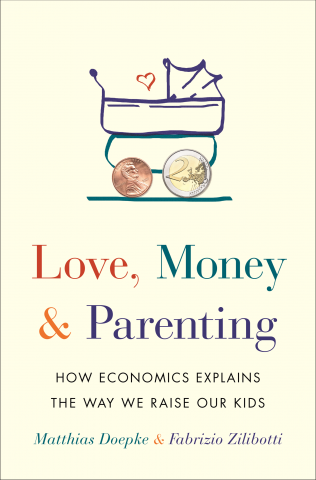 One very important determinant of parents’ child-raising strategies is the level of inequality in a given society. “Connie Lim, who performs as MILCK, originally co-wrote ‘Quiet’ in 2015. She says she always viewed it as her ‘personal therapy song,’ to help her cope with having been sexually assaulted and abused when she was a teenager. Then came the 2016 presidential election. 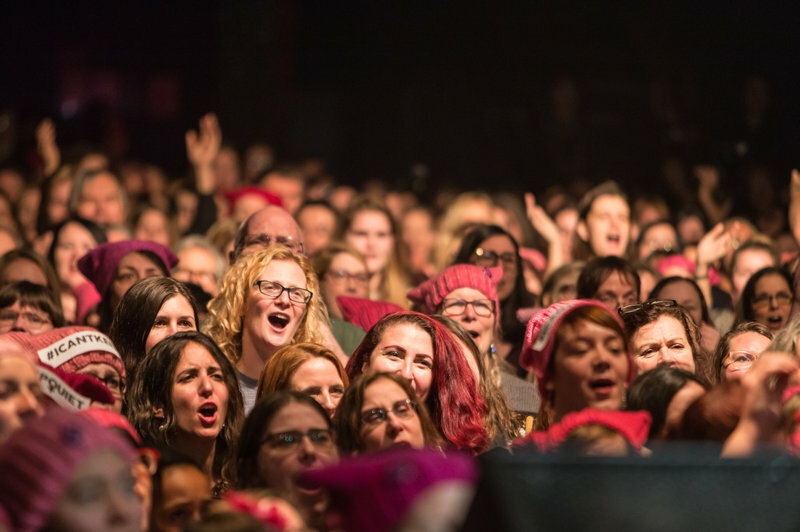 “Compelled to share ‘Quiet” with the world, she channeled her rage into an idea: Teach the song to other singers and perform it at the Women’s March in Washington, D.C., the day after President Trump’s inauguration. 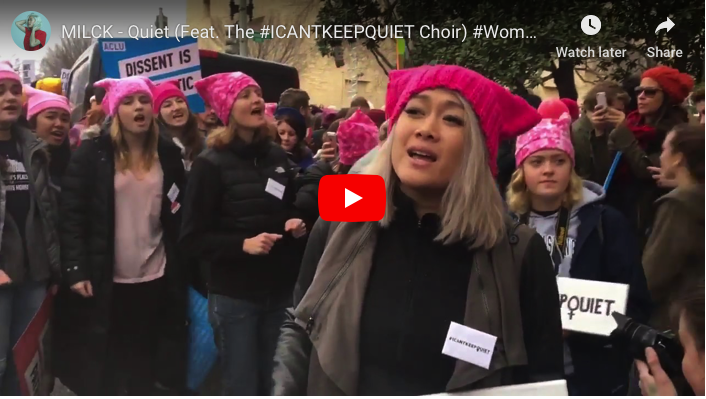 “Lim lives in Los Angeles, so about a month before the march she put out a call to female a cappella singers in D.C. Two groups responded: Capital Blend, a professional ensemble, and the GW Sirens, a college group. After lots of emailing and Skyping to learn the song and some-in person rehearsing the day before, they put on their winter coats and pink hats and headed to the march. “‘We had no idea how crowded it was going to be,’ Lim says, laughing.” Then others noticed, too. Hundreds of Choir! Choir! Choir! singers from Toronto joined MILCK to perform “Quiet” at that city’s Phoenix Concert Theatre in early 2017. Andrew Williamson/Courtesy of Choir! Choir! Choir! Video: MILCK + Choir! of 1300 Can’t Keep Quiet! The Image of the Week is titled “EPOCHS – American Idol”, by Frank Buffalo Hyde. 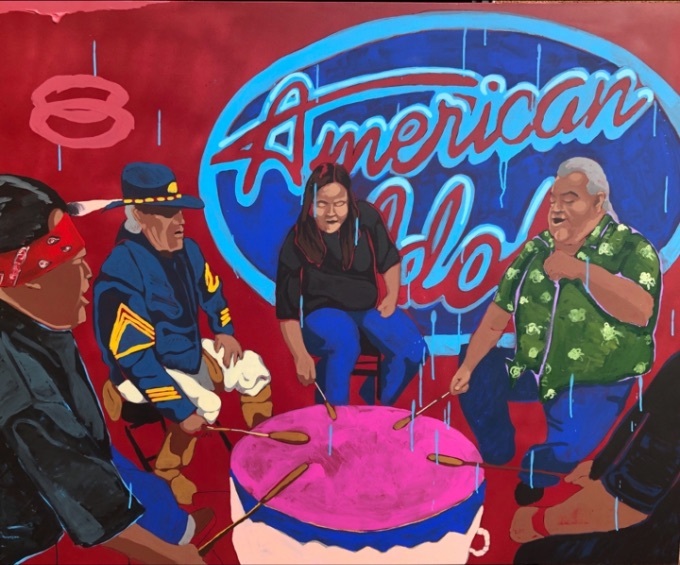 The painting “depicts a Native drum circle in front of the logo for the singing competition show American Idol. The otherwise empty background and thin, dispersed lines of blue paint emphasize the artificial, even dreamlike quality of the scene, as if it were a memory caught in the midst of recollection.